HK93 steel backplate with black buttstock and buffer assembly complete. Assembled and ready to pin onto your HK93/33/53, Z43P, C93, V93 and clone. 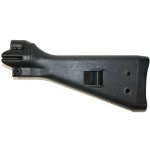 This allows you to use the latest generation HK buttstock on your HK93 or HK94 rifle. Stock assembly is perfect for use with your buffered AND non-buffered carrier. YES: the perfect stock for your Z43P SBR. Steel backplate is made by Parabellum Combat Systems from original German G3 backplates. Correct spec German steel combined with precision machining makes this the perfect HK93 backplate; an exact copy of the hard to find original. All pre-assembled complete stocks use the painted back plate. If you prefer parkerized please specify this in the customer notes box at checkout. * Parkerized or painted finish (complete stocks come with painted backplate unless parkerized is requested). * Complete stock assembly includes backplate, buffer assembly, new buttstock with new buttpad. * Will work with buffered and non buffered carriers. Product Review: Fast shipped Item looks way better in person then in pics. Fit nice on my hk93 clone.